, lord Buckhurst and earl of Dorset, an eminent statesman and poet, was born at Withyam in Sussex, in 1527. He was the son of sir Richard Sackville, who died in 1566, by Winifred Brydges (afterwards marchioness of Winchester), and grandson of John Sackville, esq. who died in 1557, by Anne Boleyne, sister of sir Thomas Boleyne, earl of Wiltshire and great grandson of Richard Sackviiie, esq. who died in 1524, by Isabel, daughter of John Digges, of Digues 1 s place in Barham, Kent, of a family which for many succeeding generations produced men of learning and genius. He was first of the university of Oxford, and, as it is supposed, of Hart-hall, now Hertford-college; but taking no degree there, he removed to Cambridge, where he commenced master of arts, and afterwards was a student of the Inner Temple. 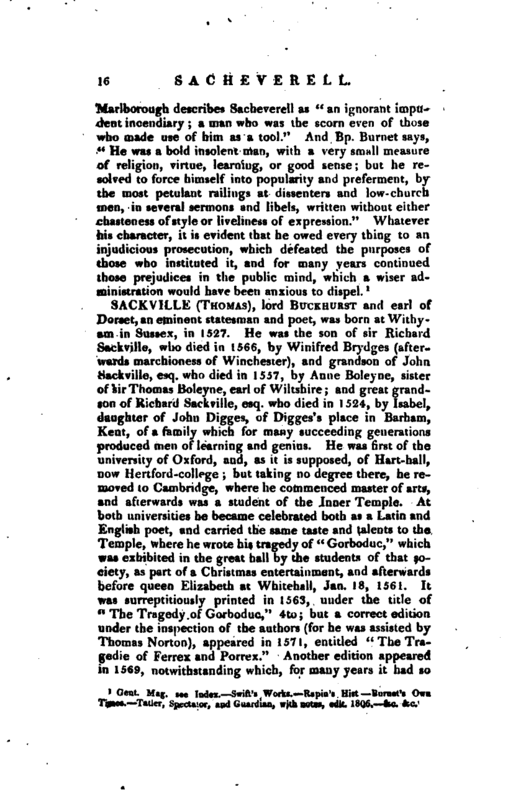 At both universities he became celebrated both as a Latin and English poet, and carried the same taste and talents to the Temple, where he wrote his tragedy of “Gorboduc,” which was exhibited in the great hall by the students of that society, as part of a Christmas entertainment, and afterwards before queen Elizabeth at Whitehall^ Jan. 18, 1561. It was surreptitiously printed in 1563, under the title of “The Tragedy of Gorboduc,” 4to; but a correct edition under the inspection of the authors (for he was assisted by Thomas Norton), appeared in 1571, entitled “The Tragedie of Ferrex and Porrex.” Another edition appeared in 1569, notwithstanding which, for many years it had so | feompletely disappeared, that Dryden and Oldham, in the reign of Charles II. do not appear to have seen it, though they pretended to criticise it; and even Wood knew just as little of it, as is plain from his telling us that it was written in old English rhyme. 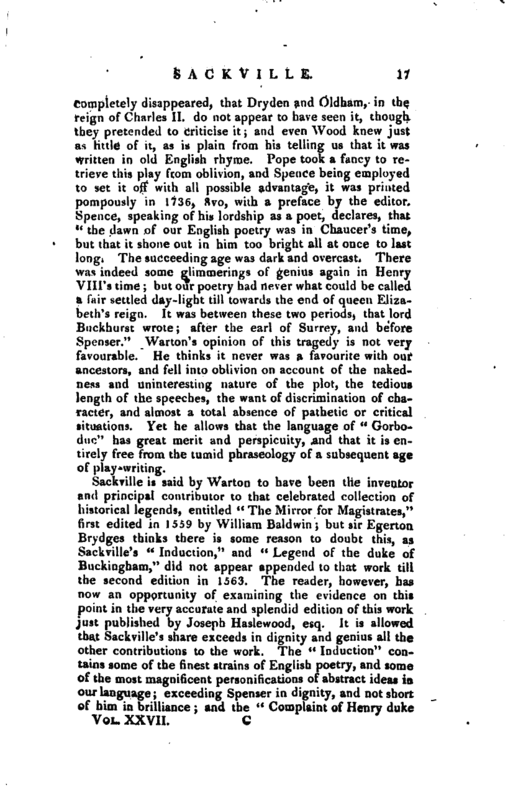 Pope took a fancy to retrieve this play from oblivion, and Spence being employed to set it off with all possible advantage, it was printed pompously in 1736, 8vo, with a preface by the editor. Spence, speaking of his lordship as a poet, declares, that “the dawn of our English poetry was in Chaucer’s time, but that it shone out in him too bright all at once to last long. The succeeding age was dark and overcast. There was indeed some glimmerings of genius again in Henry VIII‘s time but our poetry had never what could be called a fair settled day-light till towards the end of queen Elizabeth’s reign. 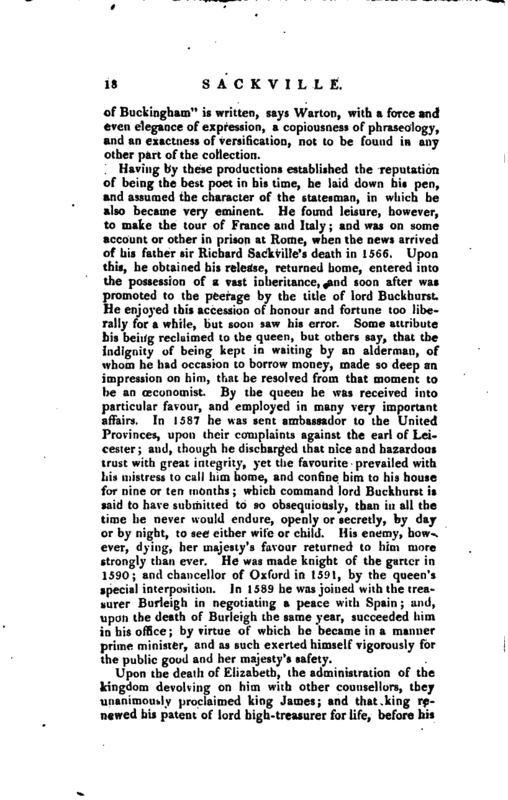 It was between these two periods, that lord Buckhurst wrote; after the earl of Surrey, and before Spenser.” Warton’s opinion of this tragedy is not very favourable. He thinks it never was a favourite with our ancestors, and fell into oblivion on account of the nakedness anil uninteresting nature of the plot, the tedious length of the speeches, the want of discrimination of character, and almost a total absence of pathetic or critical situations. Yet he allows that the language of “Gorboduc” has great merit and perspicuity, and that it is entirely free from the tumid phraseology of a subsequent age of play-writing. Having by these productions established the reputation of being the best poet in his time, he laid down his pen, and assumed the character of the statesman, in which he also became very eminent. 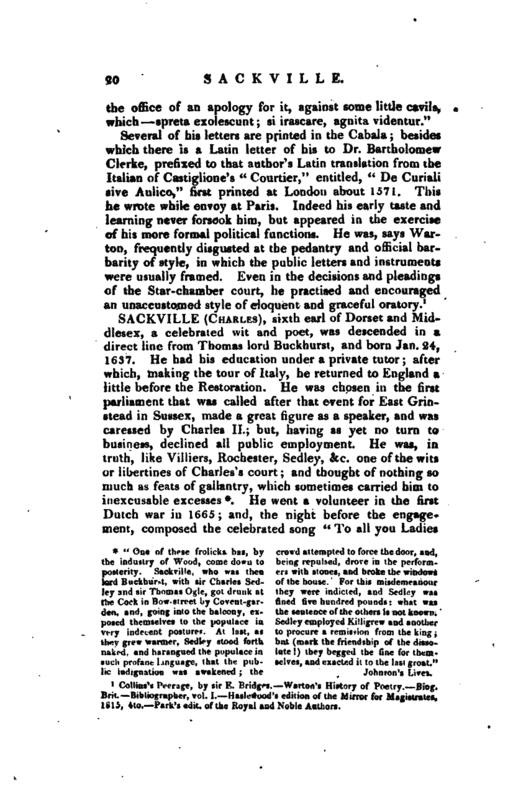 He found leisure, however, to make the tour of France and Italy; and was on some account or other in prison at Rome, when the news arrived of his father sir Richard Sackville’s death in 1566. Upon this, he obtained his release,‘ returned home, ente’red into the possession of a vast inheritance, and soon after was promoted to the peerage by the title of lord Buckhurst. He enjoyed this accession of honour and fortune too liberally for a while, but soon saw his error. Some attribute his being reclaimed to‘ the queen,- but others say, that the indignity of being kept in waiting by an alderman, of whom he had occasion to 1 borrow money, made so deep an impression oft him,“ibat he resolved from that moment to be an eeconomisi. By the queen he was received into particalar favour, and employed in many very important affairs- In 1587 he was sent ambassador to the United Provinces’,” upon 1 their complaints against the earl of Leicester ’j and y though he discharged that nice and hazardous trust with- great integrity, yet the favourite prevailed with his mistress to call him home, and confine him to his house for nine Or ten months; which command lord Buckhurst is said to have submitted to so obsequiously, than in all the time he never would endure, openly or secretly, by day or by night, to see either wife or child. 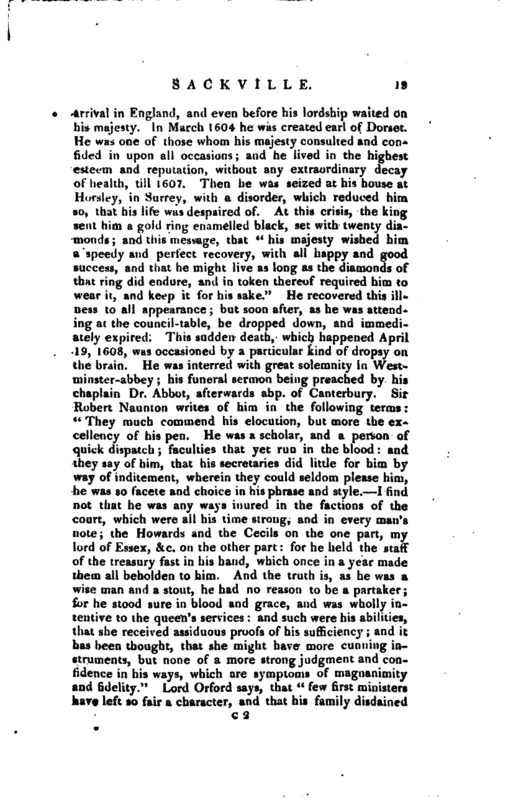 His enemy, however, dying, her majesty’s favour returned to him more strongly than ever. He was made knight of the garter in 1590; and chancellor of Oxford in 1591, by the queen’s special interposition. In 1589 he was joined with the treasurer Burleigh in negotiating a peace with Spain; and, upon the death of Burleigh the same year, succeeded him in his office; by virtue of which he became in a manner prime minister, and as such exerted himself vigorously for the public good and her majesty’s safety.